Onboard our strong, ice-classed expedition vessel, Ocean Atlantic, we are sure to get close to the dramatic coastlines. Zodiac cruising and shore landings are an important and considerable part of the planned itinerary, enabling all expedition guests to set foot several times on the Antarctic continent, as well as the many surrounding sub-antarctic islands. Departing Ushuaia in Argentina, we cross the mighty Drake Passage en-route for the South Shetland Islands, making Zodiac landings at penguin rookeries, research stations and fascinating lookuots along the way. Continuing southward, deep into the inlets of Antarctica, we pass the famous Gerlache Strait, where 3000-ft ice cliffs rise straight out of the still water. On no other journey can you exprience so much pristine nature and varied wildlife in so few days! When Ocean Atlantic returns to Tierra del Fuego and Ushuaia, we pass close to the mythical Cape Horn - the southermost point on South America and a celebrated maritime landmark. Any voyage to Antarctica is an adventure, but with a maximum capacity of 198 guests aboard Ocean Atlantic, this cruise offers a unique experience for the few. Shore landings, excursions, lectures and whale safaris are easily accommodated to help you enjoy a matchless expedition experience. Standard inside cabin, triple beds on Deck 5. Size 11-12 sq.m. Featuring a double bed or two single beds, private bathroom, and a porthole. Located on the Columbus Deck (Deck 4). Outside single Cabin. Size 9-10 m2 . Cabins feature a single bed, private bathroom, and a porthole. Located on the Columbus Deck (Deck 4). Size 12-13 sq.m. Featuring a double bed or two single beds, private bathroom, and a window. Located on the Columbus and Marco Polo Deck (Deck 4 & 5). Size 20-23 sq. m. Featuring a double bed or two single beds, a relaxing sitting area, private bathroom and a window. Limited view. Located on the Magellan and Hudson Deck (Deck 7 & 8). Size 19-24 sq.m. Featuring a double bed or two single beds, a relaxing sitting area, private bathroom and a window. Located on the Marco Polo Deck (Deck 5). Size 35 sq.m. These 2-room suites are designed with a large double bed or two twin beds, an elegant living room, large private bathroom and window. Located on the Marco Polo Deck (Deck 5). Arrive in Ushuaia, Argentina - the world’s southernmost town. Explore the quaint city or local countryside. Alternatively, consider a day trip off the beaten path to the raw, natural archipelago of Tierra del Fuego. It's a hiker's paradise with rugged snow-capped mountains, glaciers, flower-filled meadows and boggy quagmires. In the afternoon, we board our ship, Ocean Atlantic. Our journey begins as we navigate through the calms of Beagle Channel, a strait in the Tierra del Fuego Archipelago. Sailing onward, we cross the famed Drake Passage - a body of water that marks the intersection of the cold Antarctic with the warmer Atlantic and Pacific Oceans. Drake Passage is known for rollicking conditions and strong westerly winds, called the Roaring Fifties. While this passage may be challenging, you can rest confidently aboard our expedition vessel, Ocean Atlantic, which is purpose-built with stabilizers, powerful engines and a highly-qualified crew. 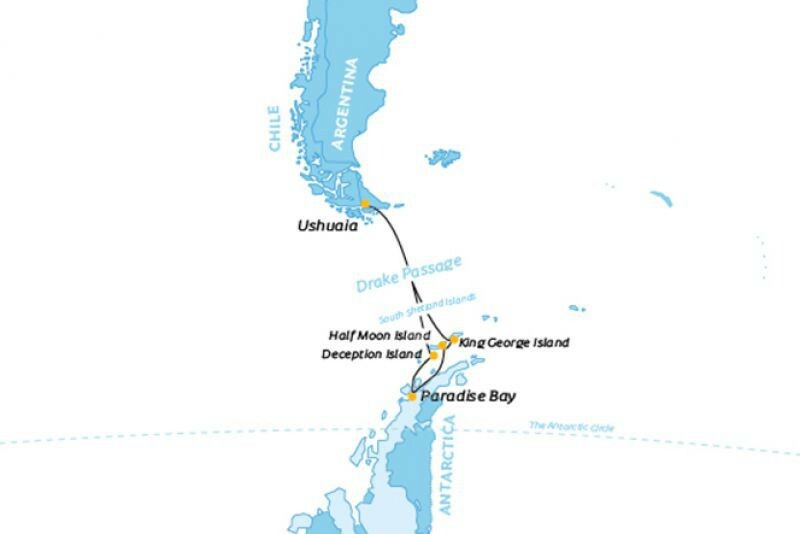 The most spirited sailors consider Drake Passage a lifetime achievement, and you will complete the crossing twice! In the Drake, the excitement builds as Antarctic wildlife comes into view. Weather permitting, we will catch our first sight of seals and penguins! The area is also well-know for its abundance of birds. Over the next two days, we will explore to the sub-Antarctic islands of the South Shetland chain. Projected landfalls include: King George Island; Deception Island, an extinct volcano with waters warm enough for a polar swim; and Half Moon Island with nesting Wilson's storm petrels and chinstrap penguins. The itinerary and activities over the next few days depend on weather and ice conditions. The route and shore landings will be determined by the captain and expedition leader and communicated to guests through regularly scheduled briefings. As the white shimmer of Antarctica looms on our horizon, the presence of wildlife multiples by tens of thousands with many species of lively penguins, inquisitive seals, nesting birds and the spray of marine mammals. Wildlife abounds along our projected route along the Antarctic Peninsula: leopard, fur and Weddell seals of Cuverville Island; humpback whales of Gerlache Strait; Paradise Bay; the dramatic Lemaire Channel's orcas. The itinerary and activities over the next few days depend on weather and ice conditions. The route and shore landings will be determined by the captain and expedition leader and communicated to guests through regularly scheduled briefings. On Day 8, we depart Antarctica and spend two days at sea on our way back to the calms of Beagle Channel and Ushuaia, Argentina. En-route, we will cross Drake Passage and cruise past Cape Horn, a legendary maritime landmark and the southern tip of South America. During our time at sea, a variety of activities will be arranged on board and it provides the perfect opportunity to socialise with fellow travellers. This morning, we arrive back in Ushuaia where our tour ends. Transfer to airport. As this is an expedition cruise to the world's most remote regions, we are at the mercy of Mother Nature. We have planned itineraries for each tour package, but to ensure the safety of our guests and crew, we may be forced to change the route. The itinerary can and will be changed according to weather, ice and local conditions, and travellers should consider this part of the journey. We strive to conduct as many shore landings, Zodiac excursions and hikes (up to 11km) as possible and these can be adjusted as desired to ensure everyone's safety. Ocean Atlantic is the perfect vessel for expedition cruising in Antarctic waters! Newly renovated in 2016 and with an international ice class rating of 1B, she is one of the strongest ships operating in Antarctica. Her high maneuverability, shallow draft and strong engines allow for extended voyages into isolated fjords, creating exciting adventures for any Antarctica traveler. Ocean Atlantic is newly renovated (2016) with elegant common areas and accommodation for 198 passengers. The ship was built in 1985 and underwent an extensive rebuild in 2010. With a length of 140m she has ample space on the multiple decks for several lecture halls, a relaxed restaurant serving 4-star international cuisine, professionally staffed bars and observation platforms – and even a pool. All common areas on the Erickson Deck feature large panel windows, enabling passengers to quickly spot passing whales and photographic sights from the comfort of indoor lounges. All private cabins are stylish appointed and feature individual bathroom facilities, phone for internal calls, individual temperature controls and TV. Ideal for relaxation, the vessels’ accommodation ranges in size from 11 - 35 m2 and are designed with either portholes or windows. Daily shore landings at penguin rookeries, research stations and other Antarctic wonders are made possible by her fleet of 20 Zodiacs. The bright, spacious restaurant prepares 4-star international cuisine. Breakfast, lunch and dinner are included in your tour price. All meals are served in the restaurant where you can enjoy the spectacular views. You have free seating at all meals. Breakfast and lunch are served buffet style, while dinner is a la carte. Meals, including daily snacks, are prepared by a professional chef. Coffee, tea and water are free during the entire cruise; other drinks can be purchased in the restaurant and at the bar. In the event you are not onboard at lunch time we will prepare a lunch bag for you in the morning, which you can take ashore. In the afternoon, we offer tea and coffee in the lounge. We also offer a midnight snack between 22:00 h and 24:00 h.
The professionally staffed bar offers a selection of soft drinks, juices, wines, liquors, spirits and beer that can be charged to your shipboard account. Enjoy the time on our observation deck while relaxing in a deckchair, take a swim in the pool or soak in the jaccuzi. Library: Our board library offers a wide range of multilingual books ranging from fiction to travel literature. Curl up with a book, watch a DVD and broaden your understanding of the region's history, flora, fauna, climate, scientific contributions and more. Entertainment: During all Albatros Expedition cruises, the focus is placed on exploration and education. From the ship's well-equipped, onboard lecture theatres, the expedition team will host a series of presentations and workshops on various topics. Shore Excursions & Landings: The expedition team will organize a series of Zodiac excursions and shore landing activities to bring you closer in touch with your natural surroundings. Gym facilities and a sauna are available onboard the ship. Large windows, comfortable seating and even binoculars create the ideal lookout to enjoy the ever-changing landscapes. Onboard our strong, ice-classed expedition vessel, Ocean Atlantic, we are sure to get close to the dramatic coastlines. Zodiac cruising and shore landings are an important and considerable part of ......click here to read more. As our voyage begins, we pilot through the calm, gunmetal grey waters and sloping glaciers of Beagle Channel. Turning southward, our journey begins in earnest, and we enter Drake Passage. ......click here to read more.